Your main concern should be the stability and integrity of your deck. The reasons for deck collapses can be varied but typically relate to age, poor maintenance, and excess load capacity. While it’s not the most exciting part of your deck, the underlying framing support is the most important. It provides the foundation for the entire structure, and because it’s the least visible, can be susceptible to hidden dangers. Also, with the pressure-treated lumber as the primary material used in its construction, there are a number of issues that must be addressed. Use a pointed tool like an ice pick or screwdriver to push into the wood. If the wood is soft and easily penetrated (1/4-1/2 inch) or you can break off pieces of the wood without it splintering, decay may be present. Uncover flashing issues – the metal or plastic guard that directs water away from the house should be secured in place. If it’s damaged or missing, consider replacing or adding to areas where water is collecting. Find loose or corroded fasteners – use a wrench, screwdriver, or hammer to tighten loose fasteners or pound any raised nails. The ledger board should be fastened with structural lag screws, not nails. Rusted fasteners should be replaced with a corrosion-resistant type. Corroded fasteners can break or cause deterioration in the surrounding wood. Look for signs of insects – use a flashlight to inspect the wood framing and corners under the deck. If you notice small holes in the wood or a concentration of insects, there may be nests with larvae and/or insect damage. Identify pest damage – from rodents (mice, squirrels, rats), raccoons, skunks, rabbits, or other animals. Animals like dark, protected spaces like the area under your deck. Look for gnaw or chew marks on wood or electrical wiring, paper or nesting material, or droppings. Ignore or cover up damaged or rotted framing—you’ll make a dangerous situation worse. Leave food out, open trash containers, store papers or nesting materials under your deck—this will encourage animals to move in. Attempt to remove rodents or other animals—vermin may carry disease or be dangerous. Contact animal control or an exterminator to handle this situation. Overload your deck beyond its load bearing capabilities. You’ll definitely want to consult with professionals when adding extras such as hot tubs or fireplaces. Once it’s been determined that the framing structure under your deck is sound, the next critical components to be checked should be the railings, banisters, and staircases. Just as the understructure can be compromised due to severe weather conditions, decay, insect and animal damage, so can the other components. Test the stability of railings, banisters, and posts attached to the frame by pushing and pulling them. They should be well secured and should not move. Measure the height from the deck floor to the top of the railing. 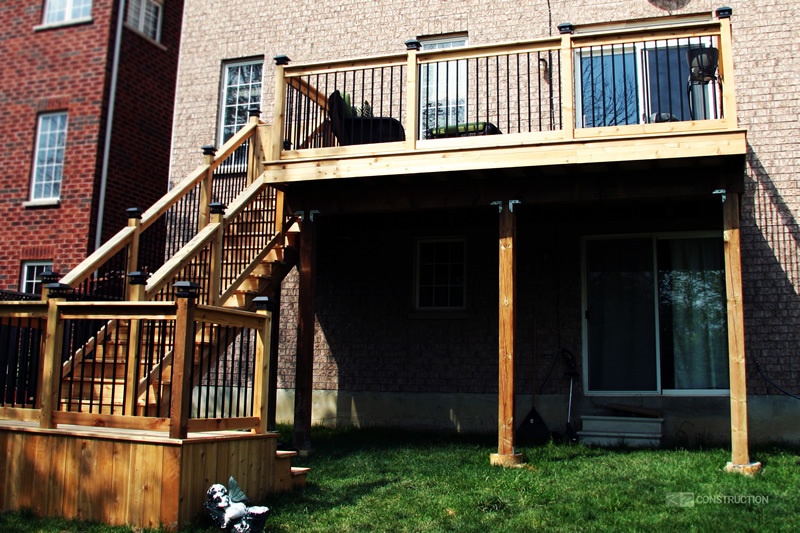 As reported in The Star, Toronto building codes require a 3-foot guard rail on decks more than two feet off the ground, and a 3-1/2-foot high railing for decks higher than six feet up. To keep small children and pets from squeezing between pickets, vertical and horizontal rails can’t be more than 4 inches apart (measured from the inside of the pickets). If you have an older deck with railings that don’t meet these requirements, contact professional deck maintenance company as soon as possible to replace them with safer components. 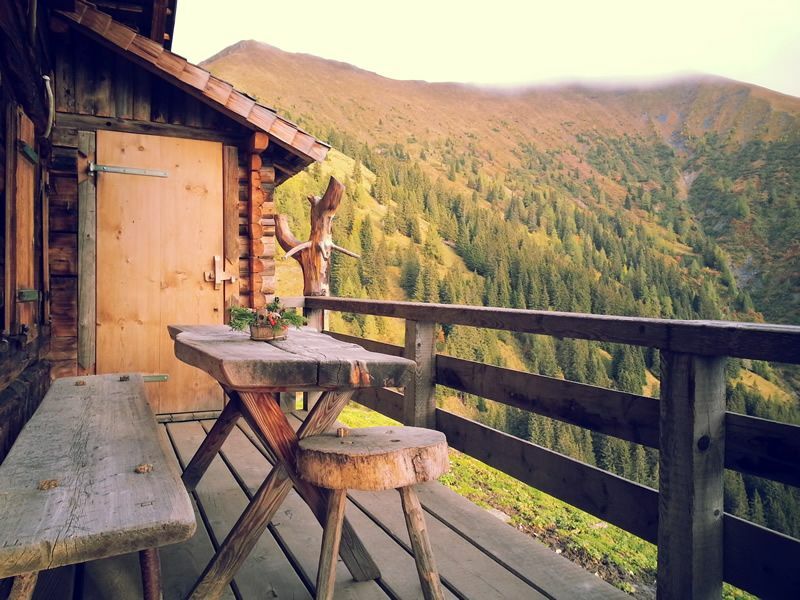 Check posts, railings, and banisters for signs of decay and splitting wood. Look for loose or corroded fasteners. Watch for the tell-tale signs of insect or animal damage. Any of these issues, in addition to shrinking or warping wood, can cause unsightly or unsafe railings. Staircase risers and stringers should be securely attached, appear level without any sagging, should be free from decay, and should not move when tested. Open treads should be no more than 4 inches high. Always maintain a clear pathway and remove tripping hazards. Allow handrails on your stairs to be interrupted with newel posts. Although it can be aesthetically pleasing, if your current deck handrail can’t be gripped from top to bottom while walking up and down the stairs, a separate obstruction-free handrail must be installed. Fasten guardrails to the deck with wood screws. Codes require a concentrated load resistance of 200 lb. in all directions. To accomplish this, a combination of blocking and bolts driven through posts or specially designed hold-down hardware should be used. Use improper hardware to hang the stairs, and don’t forget to secure the bottom stair plate to a concrete pad below (using concrete screws). Allow anyone, especially children, to sit on top of the deck railing. A fall from even 3 or 4 feet can cause serious injuries. Pressure-treated lumber – although this material is easy to use and cost-effective, it has a tendency to crack, split, and warp. Annual cleaning and an application of stain or wood preservative every two or three years is recommended. Remove any mold or mildew with mild dish detergent and scrubbing in a circular motion with a soft, bristle brush. A 2:1 mixture of distilled vinegar and water will help remove older mold stains. Redwood and cedar – these are naturally superior to pressure-treated yellow pine for durability and insect resistance. Annual cleaning and an application of water-repellent wood preservative every three to four years will protect the surface. Applying a semi-transparent stain will help maintain the wood’s natural colour. Both redwood and cedar will weather to a silvery gray colour if left unprotected. Tropical hardwoods – exotic, heavily grained woods such as massaranduba, cumaru, tigerwood, red tauari, Philippine mahogany, and ipe are all extremely hard and durable. While density prohibits easy staining, you may have luck with an oil-based penetrating stain. Wait for three months before applying a finish so excess oils will leach out. Make sure to seal the ends of the boards with special penetrating oil based products to prevent splitting and checking. Clean annually and re-apply ipe oil every three to four years. Composites and plastic lumber – although these require very little maintenance to retain their “just new” look, they do require some care. Mold and mildew can grow in damp, shady areas of the deck, so you should power wash the deck with soapy water annually (or more frequently if needed.) Stains from leaves or other debris can be removed by lightly scrubbing the stain with a soft bristle brush and rinsing thoroughly. Power wash wood products with using a fine nozzle or heavy psi. This can damage the surface of the wood. Instead, use a fan tip nozzle at least 8 inches away from the surface of the deck. Wipe soapy water off a wood deck after cleaning mold. Doing so can redistribute the mold to other areas of the deck. Use a power washer or a bucket of hot water to remove the dirty water. Leave pooling water on the deck. Whenever cleaning mold from deck surfaces, be sure to rinse thoroughly, remove excess water with a squeegee, and allow to dry. Allowing water to remain on the deck will promote additional mold growth. Fire pits, grills, fireplaces, chimineas, heaters, and candles – these each provide a warm, inviting atmosphere on your deck. Make sure each source of heat is kept away from flammable surfaces with a non-flammable pad. Lighting and electrical appliances – all lighting should be in good working order, cleaned for maximum efficiency, and obstructions removed. Add extra lighting, especially on steps and pathways. Maintain electrical outlets and appliances to be sure they meet safety codes and are GFCI (Ground Fault Circuit Interrupter) protected. Childproof outlets and relocate electrical cords to remove any tripping hazard. Furniture and storage – make sure all patio furniture is stable and positioned away from stairways and walkways. Install childproof latches on storage boxes and under-deck storage areas. Lock up all deck-related chemical products, such as cleaners, matches, light fluid, etc. 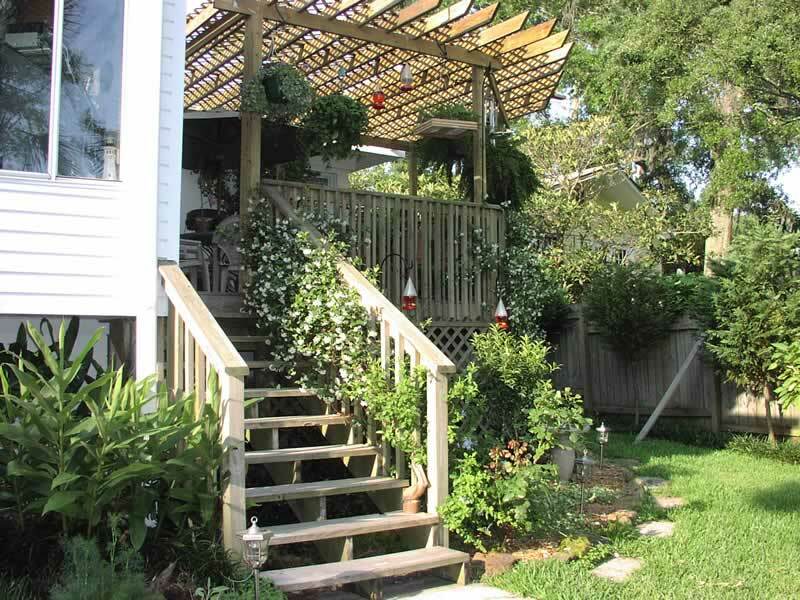 Trees and vegetation – trim branches that overhang the deck to reduce the risk of falling limbs, leaves, and nuts or seeds. These can all create a slipping/tripping hazard. Forget to allow access to the under-deck area for inspections and maintenance. Totally block ventilation under your deck. Some airflow will be necessary to dry the framing and reduce mold growth. Leave pool or hot tub access open. Make sure to install a gate to prevent small children from reaching the water unsupervised. Owning a backyard deck can provide many years of relaxation and enjoyment. You’ll want to make sure it’s safe for friends and family to use. 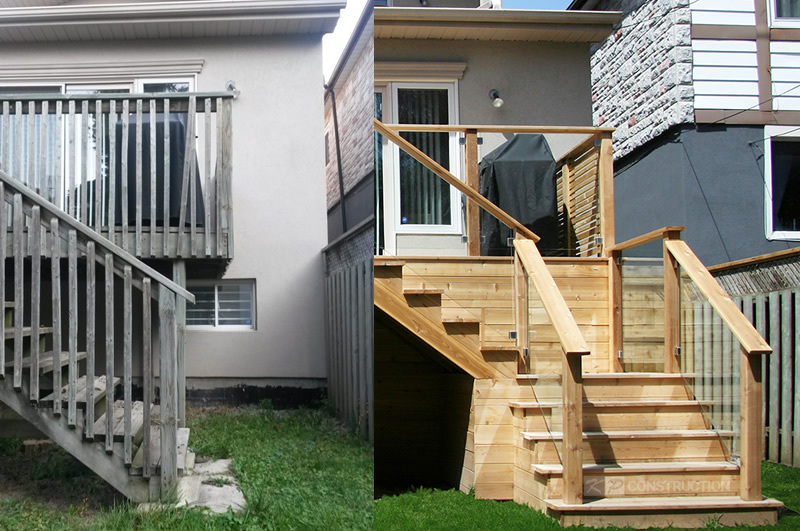 If your deck requires significant repair or reconstruction, contact KP Construction Custom Decks, the custom deck builder serving Markham, Toronto and GTA, and schedule your free consultation today. Don’t Have a Deck Yet But Ready To Start Planning? How Choose The Right Custom Deck Builder?